It was pretty obvious that it was the skull of a big cat of some kind, with most of you suggesting a Jaguar or Cheetah (either of which would make me very happy as we have the skull of neither in the Horniman collection). Unfortunately it appears to belong to neither. As I’ve mentioned before, cats are quite difficult to differentiate from each other as they haven’t been diverging for all that long and their widespread distributions can mean that populations within a particular species can be quite variable in morphology. Leopards are a good example of this, with a (once continuous) range from Korea to South Africa. As it turns out, this specimen is most likely from a Leopard Panthera pardus (Linnaeus, 1758), since it’s from an adult animal (as is clear from the well formed sagittal crest) but is on the small side for a Lion or Tiger and too big for a Cougar or Cheetah. It also lacks the broad post orbital region seen in the Cheetah and Snow Leopard, and it lacks the concave profile of both the Snow Leopard and Jaguar. All of these identification pointers can be found in this handy pdf by Margaret “Cookie” Sims. 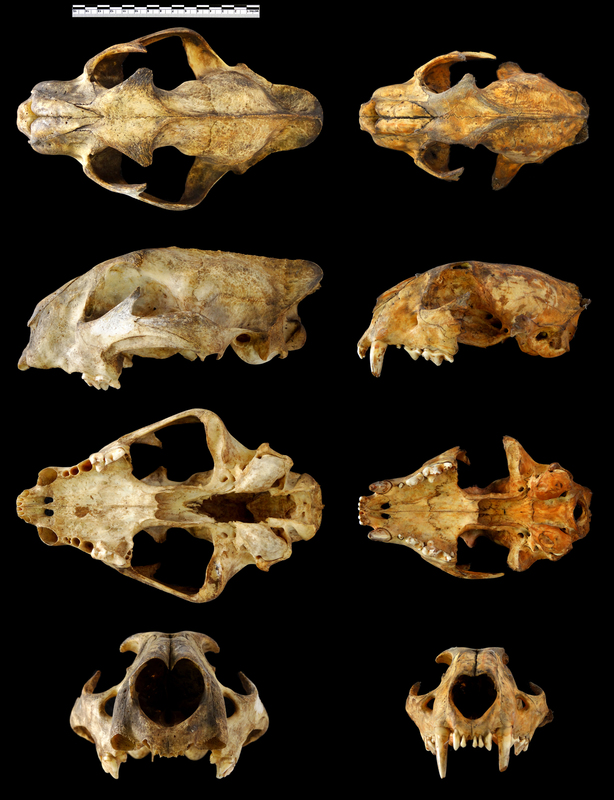 Just to show you what I mean about the variability within a species, here’s a second skull from the same box, that also matches the Leopard identification. I expect the big difference in size is largely down to sexual dimorphism, but as you can see the overall proportions are quite different as well. This may be a difference between widely separated populations, or it could just be individual variation – either way it goes to show that cats are hard to identify.